Health Tips : Buah-buahan yang baik untuk mencegah flu. Cuaca yang tidak bersahabat seperti akhir-akhir ini cenderung membuat tubuh rentan terhadap flu. Makan yang cukup dan bergizi kadang tak cukup untuk mencegahnya. Konsumsi buah segar yang benar bisa membantu mencegah flu. Buah apa saja sih yang sebaiknya dikonsumsi? Cuaca yang berubah-ubah belakangan ini membuat kondisi tubuh menurun. Makan makanan yang bergizi ternyata tak lantas membuat tubuh jadi kebal terhadap penyakit, khususnya flu. Tambahan asupan buah-buahan dalam makanan sehari-hari bisa membantu tubuh menangkal flu yang akan menyerang. Hmm..ternyata cukup mudah bukan mencegah tubuh terserang flu dan demam di musim penghujan seperti ini! Siapkan buah-buahan tadi sebagai pencuci mulut untuk memenuhi kebutuhan vitamin harian dan mencegah terserangnya flu. Tentu saja barengi dengan istirahat dan olah raga teratur ya! Unfriendly weather like these days tend to make the body vulnerable to the flu. Eat nutritious enough and sometimes not enough to prevent it. Consumption of fresh fruit that really could help prevent the flu. What's the fruit should be consumed? The weather is changing these days making body condition declined. Eat nutritious foods that were not necessarily make the body become immune to diseases, particularly influenza. 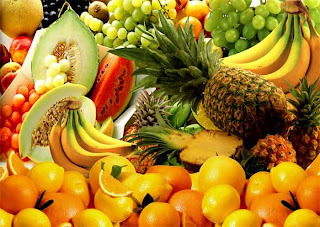 Additional intake of fruits in the daily diet can help the body ward off flu will strike. 1. Apple Have no doubt that apples are one source antioksidant popular enough at the moment. Antioxidants are contained in a single apple equals 1500mg of vitamin C. Moreover, apples will also loaded protective flavonoids highly beneficial in preventing heart attacks and cancer. 2. Papaya With 250% RDA of vitamin C contained in papaya fruit was able to prevent your system from a fever. Content of beta-caroten, vitamin C and vitamin E in reducing inflammation papaya is happening in the body and reduce the incidence of asthma. 3. Cranberries Cranberries contain high antioxidant fruits and vegetables than in general. One serving of antioxidants cranberrie contain 5 times more than broccoli. Cranberry is a natural Probiotic bacteria help to reproduce both the body and protect it from diseases borne by food. 4. Jeruk Bali Jeruk Bali loaded in vitamin C, besides orange Bali contains natural compounds called Limonoids useful for lowering cholesterol levels. Types of red grapefruit is a source of potential to fight cancer because lycopennya content. 5. Banana Bananas became one of the highest sources of vitamin B6 compared to other fruits. Bananas can reduce fatigue, depression, stress, and insomnia (difficulty sleeping). Content of its high magnesium to keep bones strong. While potassium helps prevent heart attacks and high blood pressure. Hmm .. it's not easy enough to prevent the body of the flu and fever in the rainy season like this! Prepare fruit for dessert had to meet the needs of daily vitamins and terserangnya prevent the flu. Of course barengi with rest and regular exercise ya!